While we don’t review a lot of ebook apps around here (mostly games and utilities) we did have a change to examine and test drive 3D bookshelf by Ideal Binary. 3D Bookshelf is, like every other classical ebook reader, just that – an ebook reader for the common classic books like A Christmas Carol, Sheflock Holmes, Frankenstein and many others. However, 3D Bookshelf has taken the iPhone-ebook reader a step beyond many of the other classic book reader clones by adding a cool 3D interface. As mentioned, the developers for 3D Bookshelf have built in several 3D animations. These cool animations include page turns and zooming in and out of the book and pages. 3D Bookshelf also has book scrolling just like that of cover flow in the iPod, allowing you to browse the many classic books that it has. Included with the animations are appropriate sounds (page turning) to add to the realistic experience. While within a book you can add any number of bookmarks, a necessary function of any ebook reader app. Also, while reading, you have immediate access to the book’s table of contents to easily jump around from chapter to chapter. The app however, lacks font resizing and landscape reading for those that don’t like to read in portrait mode or who would like a smaller (or bigger) font. 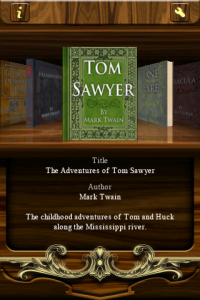 3D Bookshelf is a decent and fun classic ebook reader for the iPhone. 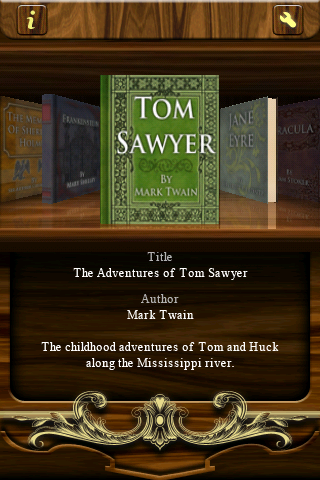 The interface is excellent and the app offers a great, wide selection of classic books that are right at your fingertips. We can easily recommend 3D Bookshelf for the classic book lovers out there that will appreciate the small animations added to enhance the reading experience. What we liked: Cool 3D interface, decent classic book selection. What we didn’t like: Needs more books? I’m always a little hesitant to read eBooks, as they don’t seem authentic, but at least this makes it look like you’re reading an older book.